WASHINGTON — Nearly three months after deeming Russia in violation of a chemical weapons law, the Trump administration has yet to impose tough new sanctions on Moscow required by the law and triggered by the poisoning last year of former Russian spy Sergei Skripal. Even as the European Union moves ahead, punishing four Russian officials this week in connection with the poisoning, the U.S. has not moved forward with its own penalties. The delay comes as the Trump administration faces intense congressional scrutiny over a Treasury Department deal to lift sanctions on companies that had been controlled by Russian oligarch Oleg Deripaska. Asked about the Skripal sanctions, the State Department told NBC News the U.S. "will proceed with our statutory requirements" but would not comment on when the sanctions will take effect. "There is no deadline in the law for imposing sanctions," the State Department said, adding, "We intend to proceed according to the statutory requirements." An earlier round of sanctions punishing Russia for the Skripal poisoning took effect in August, after the Trump administration — prodded by GOP lawmakers — determined that Russia had violated the Chemical and Biological Weapons Control and Warfare Elimination Act. Those sanctions cut off financing for some exports and licenses for selling sensitive national security goods to Russia. At the time, the State Department estimated the sanctions could cut off hundreds of millions of dollars in future exports. Those sanctions also started a three-month clock for Russia to come into compliance with the law by providing "reliable assurances" that it won't use chemical weapons in the future and agreeing to "on-site inspections" by the United Nations. Under the law, a failure to meet that deadline triggers a second, harsher round of U.S. sanctions that could include downgrading diplomatic relations, suspending the state airline Aeroflot's ability to fly to the United States and cutting off nearly all exports and imports. In early November, the administration told Congress that Russia was still violating the chemical weapons law. State Department spokeswoman Heather Nauert said at the time that "we intend to proceed" with more sanctions but did not offer a timeline. Former House Foreign Affairs Committee Chairman Rep. Ed Royce, R-Calif., repeatedly pushed the administration to follow through with those additional sanctions before he retired from Congress earlier this month. But State Department officials tell NBC News that implementing the additional sanctions is a lengthy technical process made more complicated by efforts to ensure sanctions don't have unintended consequences for American businesses. The law essentially requires the administration to choose at least three penalties out of a buffet of six options. Those include publicly opposing loans or aid to Russia from global financial institutions, barring U.S. banks from offering credit to Russia and prohibiting all exports to Russia, with limited exceptions. The other options include downgrading or suspending diplomatic relations, restricting Russian imports and moving to stop all Russian-controlled airlines from flying to or from the United States. The non-partisan Congressional Research Service in a report last month said the second wave of sanctions "could have a negative impact on the Russian economy" but that the exact impact is difficult to predict — in part because of the possibility that Russia is currently planning ways to minimize the impact. The wait for more U.S. sanctions comes amid new developments in the Mueller investigation that have raised further questions about President Trump's ties to Russia. That includes a New York Times report this month that revealed the FBI had opened an investigation in 2017 into the possibility that Trump was working for Russia against American interests, citing former law enforcement officials and others familiar with the investigation. "If you ask the folks in Russia, I've been tougher on Russia than anybody else," Trump told Fox News this month. "Nobody's been as tough as I have, from any standpoint." Over the past two years Trump's administration has imposed a raft of sanctions on Russia that experts say have in some cases exceeded what previous administrations have done. But his cozy relationship with Russian President Vladimir Putin, repeated rhetorical attacks on NATO and foreign policy positions on Syria, Ukraine and other areas have fueled the perception that Russia has broadly benefited from Trump's election. Andrew Weiss, a former Russia director at the National Security Council in the Clinton administration, said it was likely the Trump administration would take some action to fulfill the chemical weapons law's requirements, but predicted that it would be relatively minor. He said the administration would likely emphasize that it is trying to deter future chemical attacks and Russian intelligence operations rather than focusing on the past. "The administration has a fair amount of flexibility about how they apply these sanctions and we have seen abundant indications that Donald Trump isn't a big fan of imposing major sanctions versus Russia," said Weiss, now at the Carnegie Endowment for International Peace. 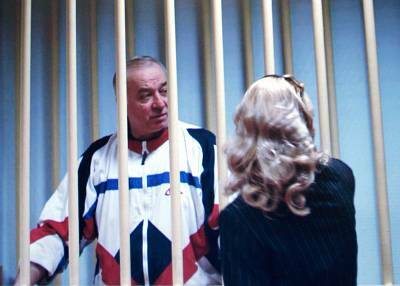 Skripal, a former Russian military officer convicted of spying for the U.K., was poisoned in March in Salisbury, England. Both he and his daughter, Yulia, were poisoned with the nerve agent Novichok, developed in the former Soviet Union. Both of them survived, but in June, two individuals a few miles away were exposed to Novichok in an incident police believe were linked, and one of those people died. 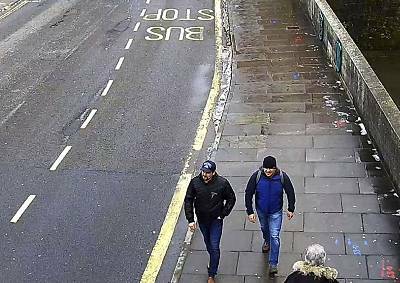 Aiming to keep up the pressure on Moscow, earlier this week the EU slapped sanctions on two high-ranking officials in the GRU, Russia's military intelligence agency, along with the two Russian operatives British authorities accuse of carrying out the attack. Moscow has adamantly denied involvement in either incident. In response to the new EU sanctions last week, the Kremlin said the Russian officials targeted by the EU were "suspected groundlessly" and that Russia had yet to be presented with evidence against them. Moscow also threatened to retaliate for the sanctions.